The Invisible Revolution has been written especially for mums by Nicola Huelin, herself a mum and award-winning business coach and mentor. It’s an inspirational and practical handbook bringing you precious insights, inspiration and real-world advice on how to start, grow and sustain a successful business – without compromising your quality of family life, health or sanity. 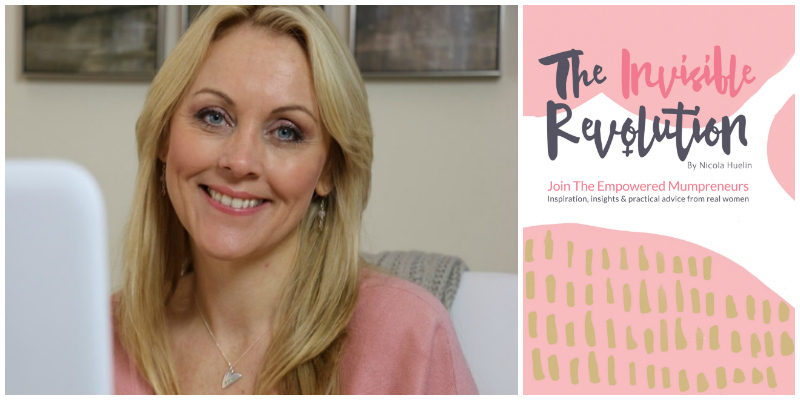 Join Nicola and a whole host of incredibly successful Mumpreneurs to discover how the women of the Invisible Revolution are carving out a new blueprint for business, achieving a new definition of success and creating a world-changing legacy for their children. Learn what it really takes to turn your dream business into reality. Mums can start up their own businesses and succeed without compromising the joys of raising children. All you need is the belief in yourself and the passion for what you work at, along with the clever knack of balancing the many roles and responsibilities of family life. As Mumpreneurs, you need certain ingredients to succeed in achieving your own definition of success with confidence and clarity in a way that’s right for you. Believe it or not, this can be achieved without having to compromise your quality of family life, health or sanity in the process. The great news is that whatever stage of the journey you’re at, combining motherhood with business, this book is for you. Welcome to the invisible revolution - welcome to our world of the empowered Mumpreneur. Nicola Huelin is a multi-award winning women's business coach and mentor, inspirational speaker and author with over 20 years in business, combining corporate experience as an executive and senior business consultant within multiple industries and 12 years as an entrepreneur, freelance and small business owner. Nicola holds an Honours degree in business economics with a specialism in marketing from Southampton University and postgraduate qualifications in business, change and project management, and was an approved Marketing Advisor on the government's Business Growth Voucher programme. A registered AMAC coach (Associate member) with the Association for Coaching, Nicola is a fully qualified Small Business Coach and Personal Transformation Life Coach, and holds a diploma in Small Business Coaching, Group Coaching and Personal Transformation Coaching from the Animas Centre for coaching, London. Trusted for her expertise, caring and down to earth approach and holistic philosophy when defining and achieving success, as well as having combined a successful career and business success with raising a family, Nicola has become a highly sought-after women's business coach and mentor to other mums in business and is on a personal mission to empower one million mums in business. Founder of the UK network of Mpower Mastermind groups and the Mpower online business community, Nicola's work has been featured on international TV, and has received multiple awards. Nicola is regularly asked to share her business expertise and her inspirational personal story to audiences internationally, and is currently preparing a TED talk on the growing power of Mumpreneurs within the UK economy.